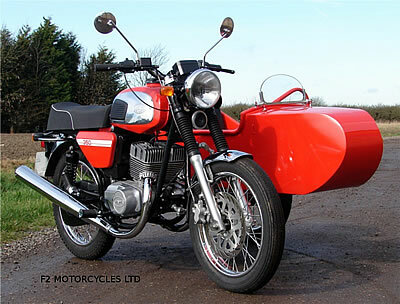 Purpose built Jawa Retro sidecar outfit. Engine specifications are the same as the Jawa 350 Retro. This is more than a styling exercise. sidecar combinations. This is how things were done in the past. This fitting system gives much lighter steering at low speeds. The need for a steering damper is removed. higher speeds (above 60/70 mph) less stable. 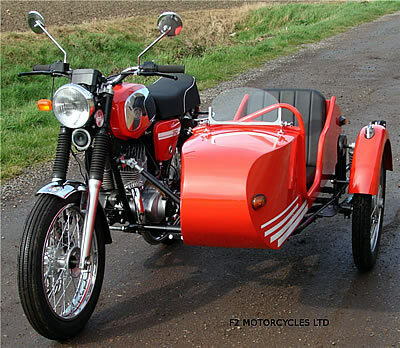 this unique and very special sidecar combination. This is a lot more than just bolting a sidecar to a Jawa. The gearing is changed and a custom designed fitting kit is used. The front fork rates are stiffened to limit dive under braking. The rear shock absorbers are changed to limit body roll in corners. 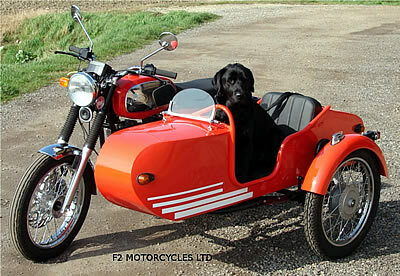 Each Jawa Retro sidecar outfit is built to order. Please ask us about lead time.